Ever since I started Hearts Of Kings, I’ve really become interested in the “world”of art and design. And it’s not that art never interest me, it’s just before I was just interested from a visual perspective. I would see something, like it or I thought it was cool, but never really looked that deep into it. As I really started to wanting to tell my stories, of how I view the (my) world, I really started admiring the works of others. Pop art is a movement I became highly interested in. Due to it’s appreciation of popular culture, pop art can be characterized as using recognizable imagery and bright colors. No one seemed to do this better than Roy Lichtenstein. 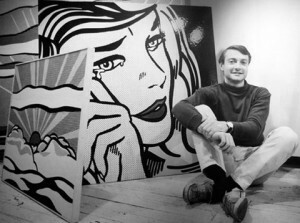 Known as one of the most prominent pop artist, Lichtenstein’s work defined pop art through parody, usually with the use of old fashioned comic strips. Below is a video that gives us all a sneak peek into the life of Lichtenstein. With interviews of those who knew him, including his wife Dorthy, this short film is sure to be enjoyed by those whom he influenced and those creatives learning about him for the first time. Take a look. As always, you’re sure to enjoy. Peace & Love!! !